We are our people. We not only focus on recruiting talented and motivated people but we support them throughout their careers so they can achieve their full potential and work within the philosophy of the R&W Way. In addition to ensuring their safety and well-being our goal is to provide career development and opportunities for every member of staff. The R&W Academy was launched to nurture, encourage and train our talented team. We are always looking for those individuals that possess that extra ingredient that, with the right environment, the correct development and the appropriate opportunities to excel, will make the most exceptional team members, in addition to having that all important R&W ‘can do’ attitude. Our dedicated Training Team ensures that our operations staff have all the necessary safety and technical qualifications they need, and we actively encourage everyone to participate in appropriate courses and work-shadowing for their continual professional development. We support staff through part-time higher education courses, such as engineering degrees, higher national certificates and diplomas. We are also committed to the recruitment of apprentices, graduates and undergraduates seeking work placements. Since being founded in 1978, with a small bank loan to purchase a second hand excavator, R&W has grown to become a multi-million pound business that employs 400+ skilled staff. Today R&W comprises seven operating businesses that together meet customer requirements and provide you with enormous potential for a diverse and rewarding career, whatever your ambition. 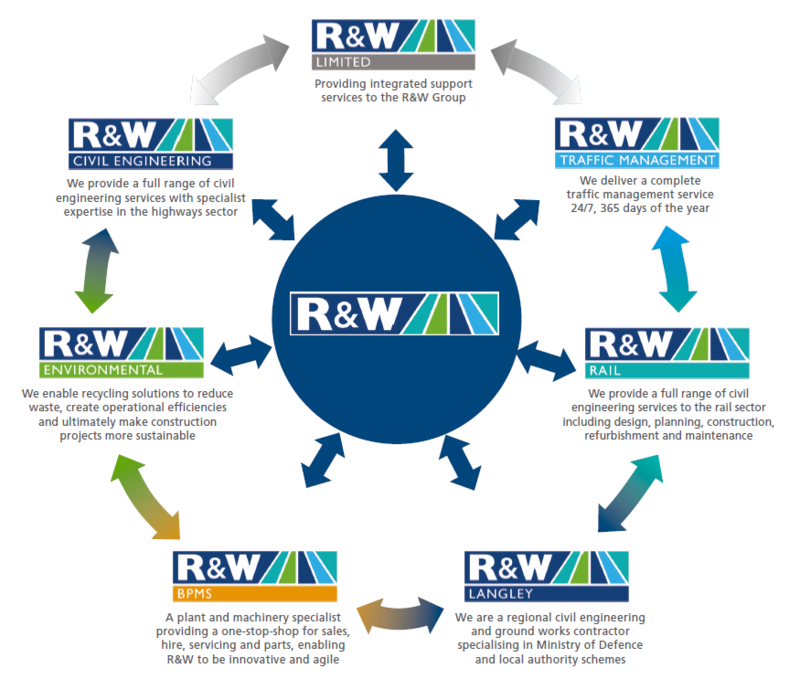 R&W is a business built on family principles, hard work, innovation, trust, collaboration and a wish to go that extra bit further for our customers. 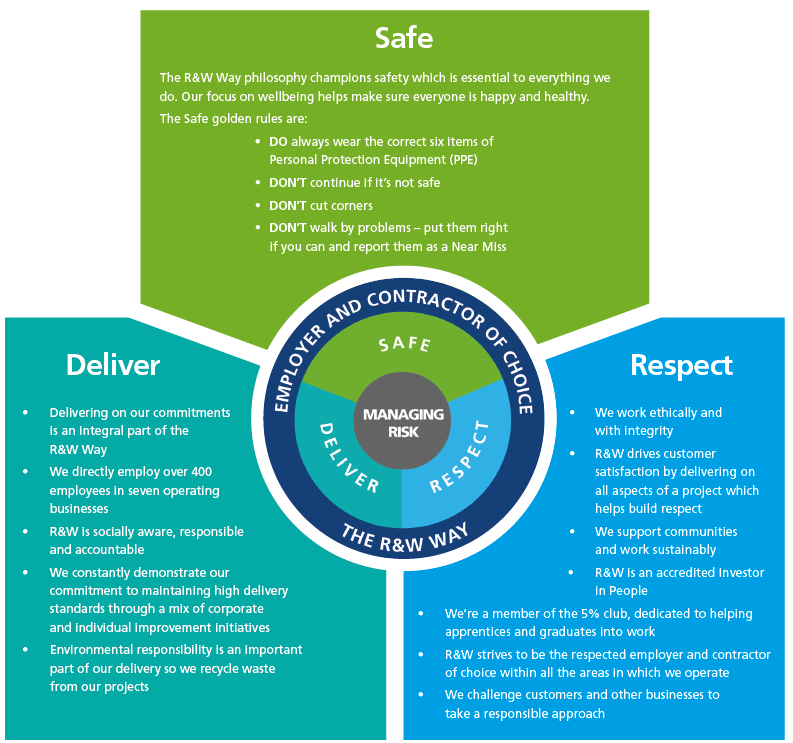 Over the years we have grown the business focusing on three key organisational pillars and these are as important today as ever. We call this the R&W Way. At its heart is our focus on managing risk, be it our own, our clients’ or those affected by our work. 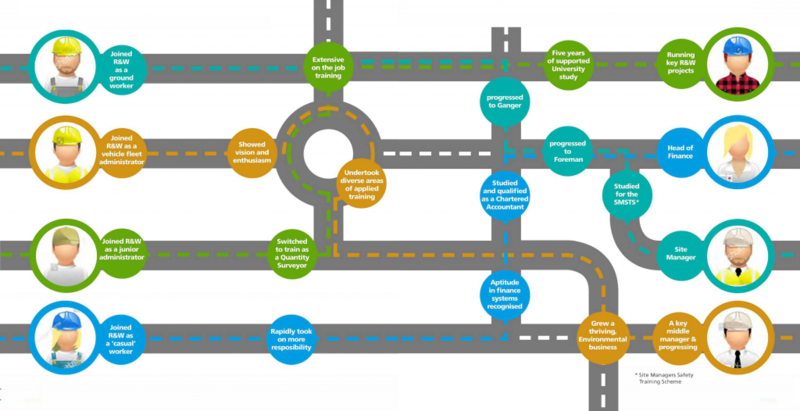 We engage early to identify, eliminate, reduce, isolate and control all risks. At R&W we nurture talent, support ambition and reward ability. When you demonstrate enthusiasm, drive and capability, we will provide you with all the support you need to progress, whatever your ambition. There are no limits to the levels you can reach. You can work your way up through our supportive organisation. Even if you embark on one path and then decide to take an alternate route, R&W will work hard to provide you with the diversity you’re looking for and an environment in which to succeed.